The first “unbiased” criticism at NutritionFacts.org lobbed at resveratrol is that science shows it impairs the benefits of exercise (there is a whole video presentation about this). Why a report published in the Journal of Physiology says so. However, that mischaracterization was roundly rebutted by other experts (“critical appraisal suggests the analyses and conclusions presented are incorrect for the result presented and will cause confusion”) and at ResveratrolNews.com (“at no time point did resveratrol meaningfully negate the effects of exercise”). There was no way that the scientific community was going to stand for that. A year later came the prior mentioned report that resveratrol blunts the positive effects of exercise. 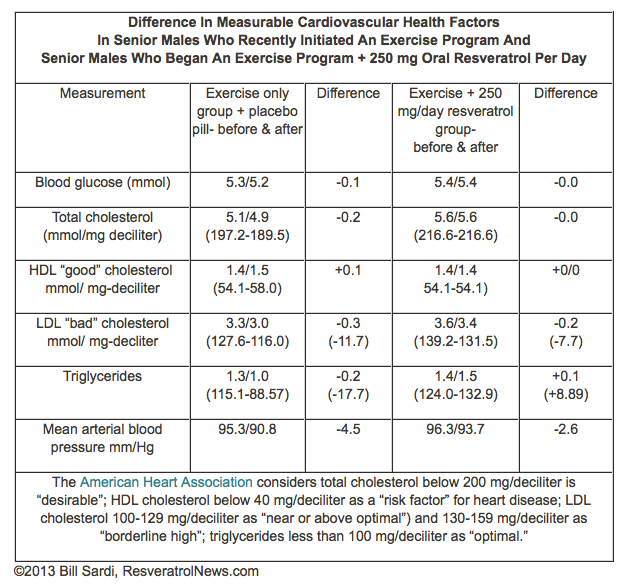 Take a look at the chart below and see if resveratrol in any meaningful way unfavorably altered blood sugar, cholesterol or blood pressure. If you haven’t been following the resveratrol story, the research is replete with false claims resveratrol is not bioavailable, not safe and not effective. However, contrary to earlier reports, a reevaluation of earlier research confirms resveratrol does in fact prolong the life of laboratory animals. Why resveratrol “does the impossible.” Resveratrol reverses the biological clock hands of time — something considered a mathematical impossibility. Resveratrol achieves neoteny – the ability to live long and look young. While billionaire oligarchs are reported to be undergoing infusions of blood from young adults to make themselves biologically young, resveratrol accomplishes this by the very same biological mechanism. A more recent study shows that resveratrol supplementation improves muscle mass and strength over and above what exercise achieved, in older adults I might add. NutritionFacts.org says over 100 published papers involving resveratrol research “have been called into question.” Ah, yes, NutritionFacts.org refers to the late Dipak Das PhD whose papers were retracted for alleged doctored science. But subsequent research conducted by other independent researchers, who used the same study design and dosage, vindicate Dr. Das’ studies that found modest-dose resveratrol protects heart muscle from damage during a heart attack, which represents the best form of cardioprotection. The archived scientific achievements of Dr. Das dwarf those of the scientific officer at NutritionFacts.org whose name is not found on a single research paper about resveratrol. However, one would think NutritionFacts.org would know how to read a research paper. That study did not involve resveratrol pills, it was a study conducted among older adults who obtain their resveratrol from wine. The wine-drinking Italians nearly halved their risk for mental decline, a fact that was buried in the research paper and follow-up news reports. Consumption of ~2.6 glasses of wine daily reduced the percentage of older adults with a low mental acuity score from 31.0% to 16.4% (see above chart). The heavy use of tobacco among heavy wine drinkers may have negated the life-prolonging benefits of modest wine drinking. NutritionFacts.org is not the only critic of resveratrol. Another recent report suggests resveratrol is NOT the long-awaited “drug of tomorrow” that will vanquish aging. But research continues. Over ten thousand published papers say the research community hasn’t completely given up on resveratrol, it has just been thrown under the rug. 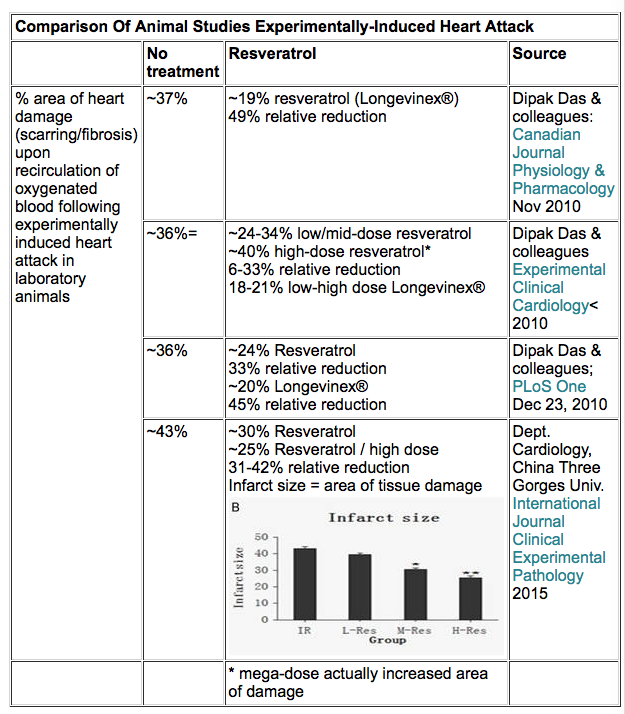 There is a lot of slanted research published about resveratrol. There haven’t been any deaths or serious side effects reported for resveratrol pills since they became popular in 2004. 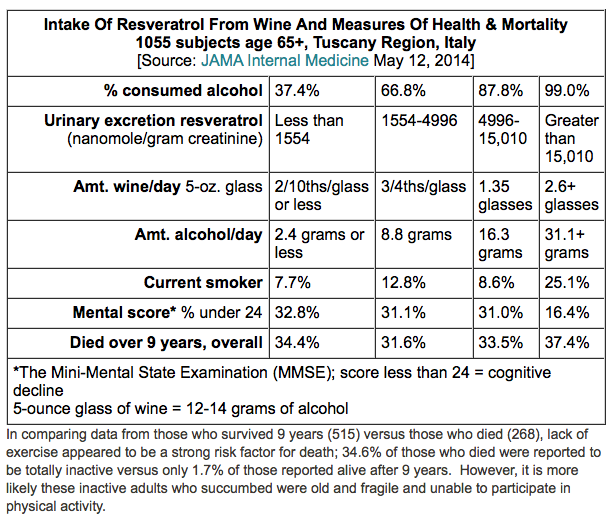 Any day now modern medicine could safely prescribe resveratrol pills and watch mortality rates decline steeply. The disease and treatment models of modern medicine are bankrupting advanced countries. People are living longer without improvement of their healthspan. Resveratrol pills are an alternative to problematic prescription drugs. Only the brave venture to take resveratrol pills against the advice of their doctors who choose to wear blinders. Sales of resveratrol pills are now estimated at ~$45 million in the US, which doesn’t even rank in the top 10 herbal supplements.